Once upon a time, a slightly goofy hip-hop duo (not the Fresh Prince and DJ Jazzy Jeff) were the hottest thing in town. That time was the 1980s, and no teenager could escape the lure of Kid ‘n Play. Kid ‘n Play were absolutely everywhere and was no surprise that they scored their own movie. If you’ve been keeping up with Bookmans’ Ultimate Movie Party blogs, you know that all of the movies chosen have a lot in common. They’ve all got memorable performances, great soundtracks, enviable outfits, and of course, an undeniable party vibe. Kid ‘n Play’s House Party truly has it all, and here’s why it should be your next Ultimate Movie Party inspiration. 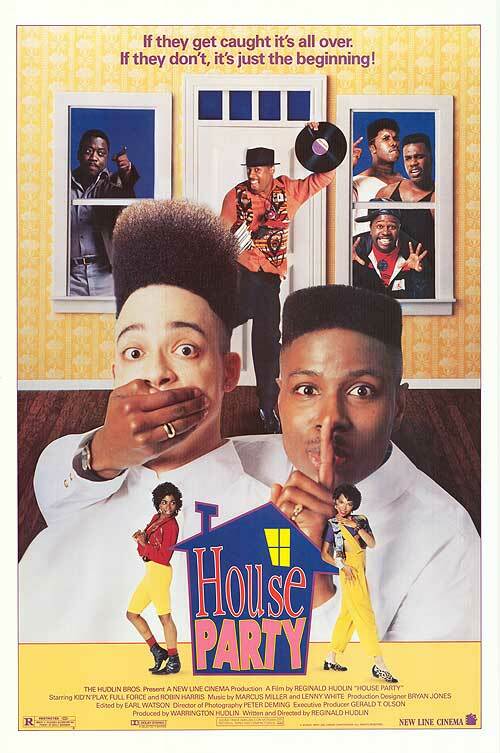 If this is your first viewing of this cult classic, be warned that House Party is a movie of its era. The vernacular of the time, the clearly 35-year old people cast as high school teenagers, and the character archetypes may not hold up so well as we approach 2020. However, this comedy is more than party worthy, and there’s a reason that it has earned cult status. Let’s PARTY! When Peter (Play, aka Christopher Martin) learns that his parents are going out of town, he knows that it is his duty as a high school student to throw a house party. After a run-in with school bully Stab and his three brothers, his grounded best friend Kid (Christopher Reid) has to sneak past his pop to get to the party. Will all the planning, scheming, and dance-offs be worth it if they can have an epic house party? You know it will! If it’s too tight or too preppy, it’s just right for a House Party party! House Party’s dress code is all over the map, but every character’s costume is fun, colorful, and somehow magically relevant today. When you see recent artists like Janelle Monae rocking a highly-stylized outfit while dancing a finely-choreographed number, know that it came from acts like Kid ‘n Play and the late 80s and early 90s hip hop culture they were a part of. Have your guests sport their most vibrant colors, button-down shirts, lycra, and spandex. Be sure to tuck those khakis into a pair of socks before you hit the dance floor. Speaking of hitting the dance floor, no House Party party would be complete without a full-fledged dance-off. Want to learn some old school dance moves that you can show your guests? This video has four that you’ll master in no time, including the Kid ‘n Play. House Party’s Martin Lawrence gave a memorable performance as Bilal, the house party DJ. Even if he wasn’t initially psyched for the gig, he definitely made that party what it was. The House Party soundtrack has some great songs that should be worked into your playlist. If you really want to make the party memorable, give every one of them the chance to DJ your shindig. Have them bring their own playlists, vinyl, or instruments and make your party rock in their own way. What better time than a House Party Ultimate Movie Party to indulge your inner teenager? This is the party where pizza is king, popcorn, soda, and M&Ms are mandatory. If you’re feeling super nostalgic for the 80s and 90s, bust out some ring pops and candy necklaces. Your guests will be happy to wear them as they dance. Normally, an Ultimate Movie Party blog gives decor tips. This time around, all you need is the house to have an Ultimate Movie Party House Party party. Of course, it’s just good manners to clean up before your party. It’s also good for your soul to dance your heart out while you clean up before and after the party.